This seven week exploration of drums begins Friday, January 18 from 5:00-5:45. The facilitator will use multicultural music and introduce world rhythms using a variety of percussion instruments. No previous musical experience required. No need to go home and practice after a class! Just show up and rock out! For ages 5 though 11. Cost: $105. Space is limited to 8 participants, so call the Academy NOW to reserve your child’s spot. Fun for the whole family, this 45-minute recreational drumming experience meets the first Saturday of the month at 2:30. Our first one will take place on February 2. This class is for families (age 5 and up). Adults must be accompanied by kids. Cost: $5 per family member but the price is capped at $20 per family! No experience required! 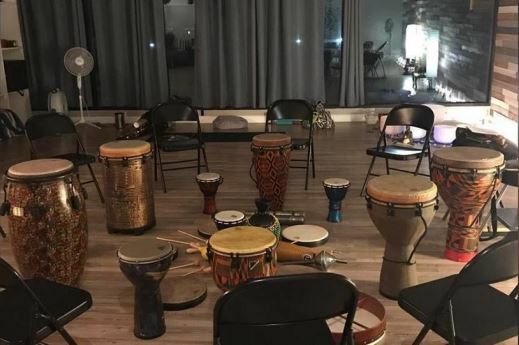 This 45-minute drum circle meets the first Saturday of the month at 3:30 beginning February 2. No experience required! Reap the benefits of drumming in a fun, safe environment. Cost: $10 per person. All of these jam sessions are lead by KMA’s percussion instructor, John Stolfe. For more information, or to register for these offerings, please call the Academy at 847-72-MUSIC(68742).